This is “Understanding Software: A Primer for Managers”, chapter 9 from the book Getting the Most Out of Information Systems: A Manager's Guide (v. 1.0). For details on it (including licensing), click here. Understand the concept of distributed computing and its benefits. Understand the client-server model of distributed computing. Know what Web services are and the benefits that Web services bring to firms. Appreciate the importance of messaging standards and understand how sending messages between machines can speed processes, cut costs, reduce errors, and enable new ways of doing business. When computers in different locations can communicate with one another, this is often referred to as distributed computingA form of computing where systems in different locations communicate and collaborate to complete a task.. Distributed computing can yield enormous efficiencies in speed, error reduction, and cost savings and can create entirely new ways of doing business. Designing systems architecture for distributed systems involves many advanced technical topics. Rather than provide an exhaustive decomposition of distributed computing, the examples that follow are meant to help managers understand the bigger ideas behind some of the terms that they are likely to encounter. 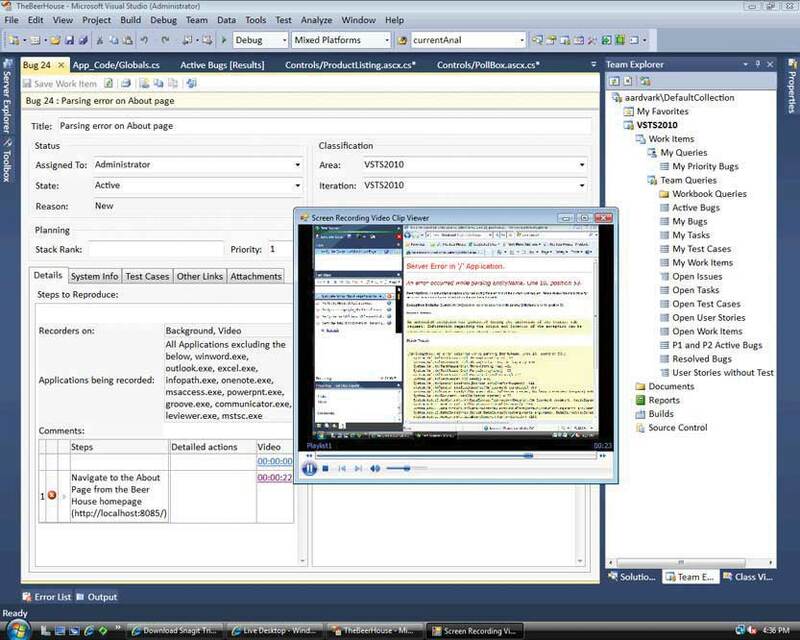 Let’s start with the term serverA program that fulfills the requests of a client.. This is a tricky one because it’s frequently used in two ways: (1) in a hardware context a server is a computer that has been configured to support requests from other computers (e.g., Dell sells servers) and (2) in a software context a server is a program that fulfills requests (e.g., the Apache open source Web server). Most of the time, server software resides on server-class hardware, but you can also set up a PC, laptop, or other small computer to run server software, albeit less powerfully. And you can use mainframe or super-computer-class machines as servers, too. It is possible to link simple scripting languages to a Web server for performing calculations, accessing databases, or customizing Web sites. But more advanced distributed environments may use a category of software called an application serverSoftware that houses and serves business logic for use (and reuse) by multiple applications.. 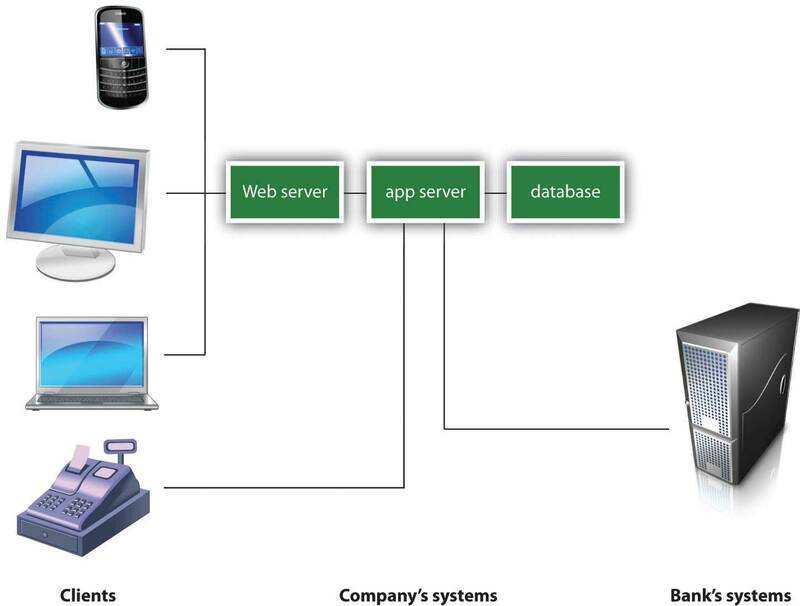 The application server (or app server) houses business logic for a distributed system. Individual Web servicesSmall pieces of code that are accessed via the application server which permit interoperable machine-to-machine interaction over a network. served up by the app server are programmed to perform different tasks: returning a calculation (“sales tax for your order will be $11.58”), accessing a database program (“here are the results you searched for”), or even making a request to another server in another organization (“Visa, please verify this customer’s credit card number for me”). In this multitiered distributed system, client browsers on various machines (desktop, laptop, mobile) access the system through the Web server. The cash register doesn’t use a Web browser, so instead the cash register logic is programmed to directly access the services it needs from the app server. Web services accessed from the app server may be asked to do a variety of functions, including perform calculations, access corporate databases, or even make requests from servers at other firms (for example, to verify a customer’s credit card). Those little chunks of code that are accessed via the application server are sometimes referred to as Web services. The World Wide Web consortium defines Web services as software systems designed to support interoperable machine-to-machine interaction over a network.W3C, “Web Services Architecture,” W3C Working Group Note, February 11, 2004. And when computers can talk together (instead of people), this often results in fewer errors, time savings, cost reductions, and can even create whole new ways of doing business! Each Web service defines the standard method for other programs to request it to perform a task and defines the kind of response the calling client can expect back. These standards are referred to as application programming interfaces (APIs)Programming hooks, or guidelines, published by firms that tell other programs how to get a service to perform a task such as send or receive data. For example, Amazon.com provides APIs to let developers write their own applications and Websites that can send the firm orders..
Look at the advantages that Web services bring a firm like Amazon. Using Web services, the firm can allow the same order entry logic to be used by Web browsers, mobile phone applications, or even by third parties who want to access Amazon product information and place orders with the firm (there’s an incentive to funnel sales to Amazon—the firm will give you a cut of any sales that you send Amazon’s way). Organizations that have created a robust set of Web services around their processes and procedures are said to have a service-oriented architecture (SOA)A robust set of Web services built around an organizations processes and procedures.. Organizing systems like this, with separate applications in charge of client presentation, business logic, and database, makes systems more flexible. Code can be reused, and each layer can be separately maintained, upgraded, or migrated to new hardware—all with little impact on the others. Web services sound geeky, but here’s a concrete example illustrating their power. Southwest Airlines had a Web site where customers could book flights, but many customers also wanted to rent a car or book a hotel, too. To keep customers on Southwest.com, the firm and its hotel and rental car partners created a set of Web services and shared the APIs. Now customers visiting Southwest.com can book a hotel stay and rental car on the same page where they make their flight reservation. This process transforms Southwest.com into a full service travel destination and allows the site to compete head-to-head with the likes of Expedia, Travelocity, and Orbitz.J. McCarthy, “The Standards Body Politic,” InfoWorld, May 17, 2002. Think about why Web services are important from a strategic perspective. By adding hotel and rental car services, Southwest is now able to eliminate the travel agent, along with any fees they might share with the agent. This shortcut allows the firm to capture more profits or pass on savings to customers, securing its position as the first place customers go for low-cost travel. And perhaps most importantly, Southwest can capture key data from visitor travel searches and bookings (something it likely couldn’t do if customers went to a site like Expedia or Travelocity). Data is a hugely valuable asset, and this kind of customer data can be used by Southwest to send out custom e-mail messages and other marketing campaigns to bring customers back to the airline. As geeky as they might at first seem, Web services can be very strategic! Southwest.com uses Web services to allow car rental and hotel firms to book services through Southwest. 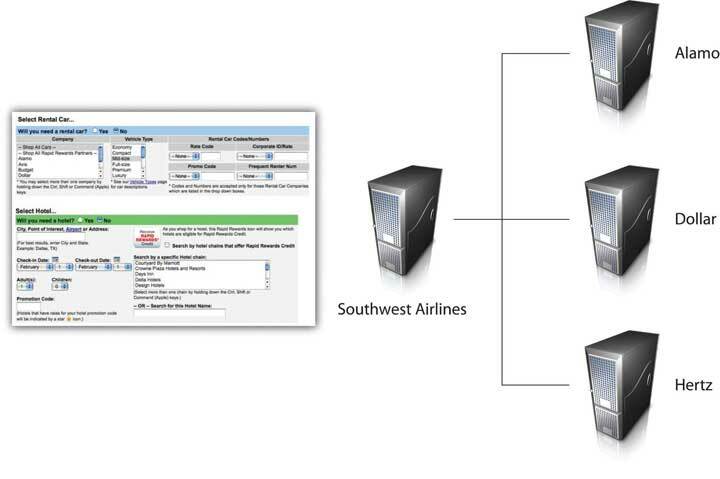 This process transforms Southwest.com into a full-service online travel agent. Two additional terms you might hear within the context of distributed computing are EDI and XML. EDI (electronic data interchange)A set of standards for exchanging messages containing formatted data between computer applications. is a set of standards for exchanging information between computer applications. EDI is most often used as a way to send the electronic equivalent of structured documents between different organizations. Using EDI, each element in the electronic document, like a firm name, address, or customer number, is coded so that it can be recognized by the receiving computer program. Eliminating paper documents makes businesses faster and lowers data entry and error costs. One study showed that firms that used EDI decreased their error rates by 82 percent and their cost of producing each document fell by up to 96 percent.“Petroleum Industry Continues to Explore EDI,” National Petroleum News 90, no. 12 (November 1998). EDI is a very old standard, with roots stretching back to the 1948 Berlin Air Lift. While still in use, a new generation of more-flexible technologies for specifying data standards are taking its place. Chief among the technologies replacing EDI is extensible markup language (XML)A tagging language that can be used to identify data fields made available for use by other applications. Most APIs and Web services send messages where the data exchanged is wrapped in identifying XML tags.. XML has lots of uses, but in the context of distributed systems, it allows software developers to create a set of standards for common data elements that, like EDI messages, can be sent between different kinds of computers, different applications, and different organizations. XML is often thought of as easier to code than EDI, and it’s more robust because it can be extended—organizations can create formats to represent any kind of data (e.g., a common part number, photos, the complaint field collected by customer support personal). In fact, most messages sent between Web services are coded in XML (the technology is a key enabler in mashups, discussed in Chapter 6 "Peer Production, Social Media, and Web 2.0"). Many computer programs also use XML as a way to export and import data in a common format that can be used regardless of the kind of computer hardware, operating system, or application program used. And if you design Web sites, you might encounter XML as part of the coding behind the cascading style sheets (CSS) that help maintain a consistent look and feel to the various Web sites in a given Web site. Using Rearden, firms can offer their busy employees a sort of Web-based concierge/personal assistant. Rearden offers firms a one-stop shop where employees can not only make the flight, car, and hotel bookings they might do from a travel agent, they can also book dinner reservations, sports and theatre tickets, and arrange for business services like conference calls and package shipping. Rearden doesn’t supply the goods and services it sells. Instead it acts as the middleman between transactions. A set of open APIs to its Web services allows Rearden’s one hundred and sixty thousand suppliers to send product and service data to Rearden, and to receive booking and sales data from the site. In this ultimate business mashup, a mobile Rearden user could use her phone to book a flight into a client city, see restaurants within a certain distance of her client’s office, have these locations pop up on a Google map, have listings accompanied by Zagat ratings and cuisine type, book restaurant reservations through Open Table, arrange for a car and driver to meet her at her client’s office at a specific time, and sync up these reservations with her firm’s corporate calendaring systems. If something unexpected comes up, like a flight delay, Rearden will be sure she gets the message. The system will keep track of any cancelled reservation credits, and also records travel reward programs, so Rearden can be used to spend those points in the future. In order to pull off this effort, the Rearden maestros are not only skilled at technical orchestration, but also in coordinating customer and supplier requirements. As TechCrunch’s Erick Schonfeld put it, “The hard part is not only the technology—which is all about integrating an unruly mess of APIs and Web services—[it also involves] signing commercially binding service level agreements with [now over 160,000] merchants across the world.” For its efforts, Rearden gets to keep between 6 percent and 25 percent of every nontravel dollar spent, depending on the service. The firm also makes money from subscriptions, and distribution deals. The firm’s first customers were large businesses and included ConAgra, GlaxoSmithKline, and Motorola. Rearden’s customers can configure the system around special parameters unique to each firm: to favor a specific airline, benefit from a corporate discount, or to restrict some offerings for approved employees only. Rearden investors include JPMorgan Chase and American Express—both of whom offer Rearden to their employees and customers. Even before the consumer version was available, Rearden had over four thousand corporate customers and two million total users, a user base larger than better-known firms like Salesforce.com.M. Arrington, “Rearden Commerce: Time for the Adults to Come In and Clean House,” TechCrunch, April 5, 2007; E. Schonfeld, “At Rearden Commerce, Addiction Is Job One,” TechCrunch, May 6, 2008; and M. Arrington, “2008: Rearden Commerce Has a Heck of a Year,” TechCrunch, January 13, 2009. Connectivity has made our systems more productive and enables entire new strategies and business models. But these wonderful benefits come at the price of increased risk. When systems are more interconnected, opportunities for infiltration and abuse also increase. Think of it this way—each “connection” opportunity is like adding another door to a building. The more doors that have to be defended, the more difficult security becomes. It should be no surprise that the rise of the Internet and distributed computing has led to an explosion in security losses by organizations worldwide. Client-server computing is a method of distributed computing where one program (a client) makes a request to be fulfilled by another program (a server). Server is a tricky term and is sometimes used to refer to hardware. 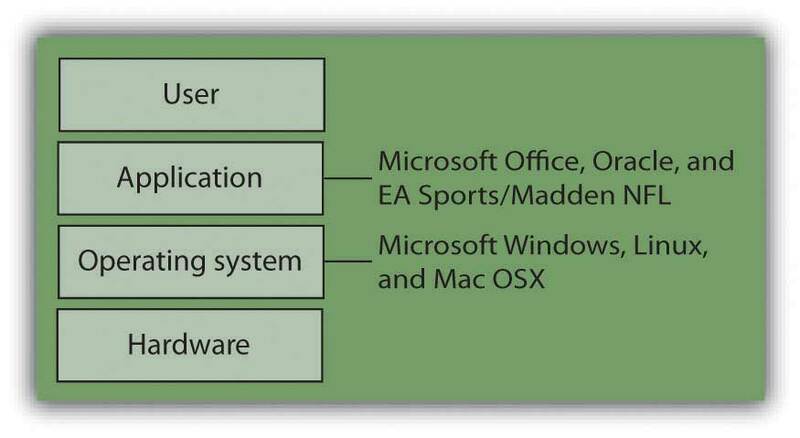 While server-class hardware refers to more powerful computers designed to support multiple users, just about any PC or notebook can be configured to run server software. Web servers serve up Web sites and can perform some scripting. Most firms serve complex business logic from an application server. Isolating a system’s logic in three or more layers (presentation or user interface, business logic, and database) can allow a firm flexibility in maintenance, reusability, and in handling upgrades. Web services allow different applications to communicate with one another. APIs define the method to call a Web service (e.g., to get it to do something), and the kind of response the calling program can expect back. Web services make it easier to link applications as distributed systems, and can make it easier for firms to link their systems across organizations. Popular messaging standards include EDI (older) and XML. Sending messages between machines instead of physical documents can speed processes, drastically cut the cost of transactions, and reduce errors. Distributed computing can yield enormous efficiencies in speed, error reduction, and cost savings and can create entirely new ways of doing business. When computers can communicate with each other (instead of people), this often results in fewer errors, time savings, cost reductions, and can even create whole new ways of doing business. Web services, APIs, and open standards not only transform businesses, they can create entire new firms that change how we get things done. Differentiate the term “server” used in a hardware context, from “server” used in a software context. Describe the “client-server” model of distributed computing. What products that you use would classify as leveraging client-server computing? List the advantages that Web services have brought to Amazon. How has Southwest Airlines utilized Web services to its competitive advantage? What is Rearden Commerce and which technologies does it employ? Describe Rearden Technology’s revenue model. Who were Rearden Technology’s first customers? Who were among their first investors? What are the security risks associated with connectivity, the Internet, and distributed processing? List the different cost categories that comprise total cost of ownership. Understand that once a system is implemented, the costs of maintaining and supporting the system continue. List the reasons that technology development projects fail and the measures that can be taken to increase the probability of success. Managers should recognize that there are a whole host of costs that are associated with creating and supporting an organization’s information systems. Of course, there are programming costs for custom software as well as purchase, configuration, and licensing costs for packaged software, but there’s much, much more. 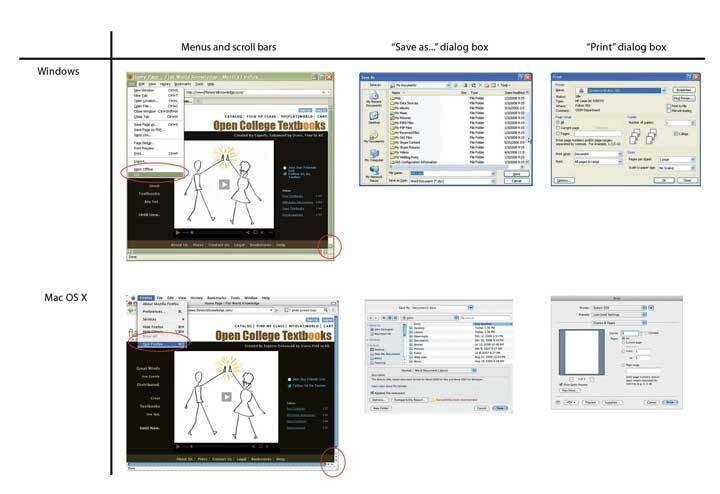 There are costs associated with design and documentation (both for programmers and for users). There are also testing costs. New programs should be tested thoroughly across the various types of hardware the firm uses, and in conjunction with existing software and systems, before being deployed throughout the organization. Any errors that aren’t caught can slow down a business or lead to costly mistakes that could ripple throughout an organization and its partners. Studies have shown that errors not caught before deployment could be one hundred times more costly to correct than if they were detected and corrected beforehand.R. Charette, “Why Software Fails,” IEEE Spectrum, September 2005.
vigilantly managing the moving target of computer security issues. With so much to do, it’s no wonder that firms spend 70 to 80 percent of their information systems (IS) budgets just to keep their systems running.C. 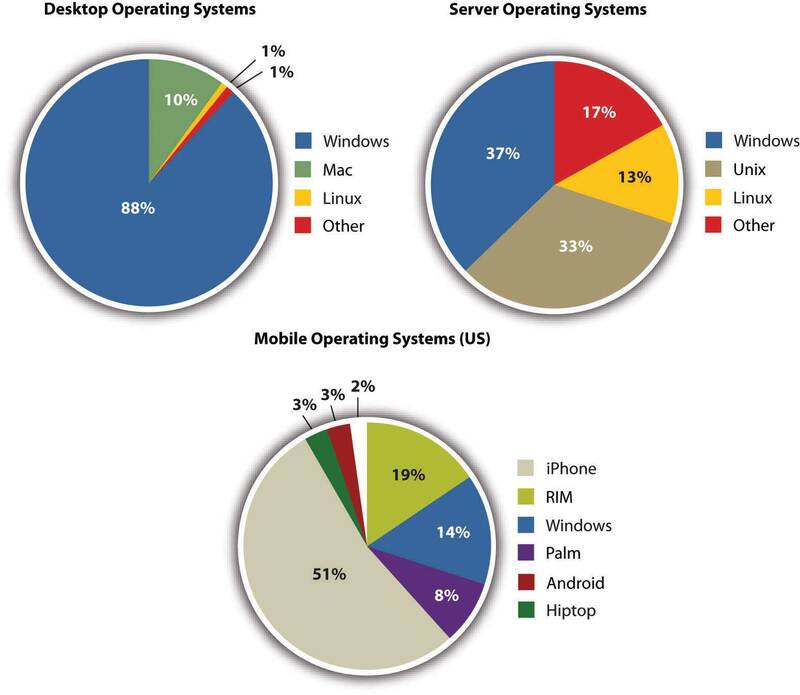 Rettig, “The Trouble with Enterprise Software,” MIT Sloan Management Review 49, no. 1 (2007): 21–27. The price tag and complexity of these tasks can push some managers to think of technology as being a cost sink rather than a strategic resource. These tasks are often collectively referred to as the total cost of ownership (TCO)All of the costs associated with the design, development, testing, implementation, documentation, training and maintenance of a software system. of an information system. Understanding TCO is critical when making technology investment decisions. TCO is also a major driving force behind the massive tech industry changes discussed in Chapter 10 "Software in Flux: Partly Cloudy and Sometimes Free". Even though information systems represent the largest portion of capital spending at most firms, an astonishing one in three technology development projects fail to be successfully deployed.L. Dignan, “Survey: One in 3 IT Projects Fail; Management OK with It,” ZDNet, December 11, 2007. Imagine if a firm lost its investment in one out of every three land purchases, or when building one in three factories. These statistics are dismal! Writing in IEEE Spectrum, risk consultant Robert Charette provides a sobering assessment of the cost of software failures, stating, “The yearly tab for failed and troubled software conservatively runs somewhere from sixty to seventy billion dollars in the United States alone. For that money, you could launch the space shuttle one hundred times, build and deploy the entire 24-satellite Global Positioning System, and develop the Boeing 777 from scratch—and still have a few billion left over.”R. Charette, “Why Software Fails,” IEEE Spectrum, September 2005. Why such a bad track record? Sometimes technology itself is to blame, other times it’s a failure to test systems adequately, and sometimes it’s a breakdown of process and procedures used to set specifications and manage projects. In one example, a multimillion-dollar loss on the NASA Mars Observer was traced back to a laughably simple oversight—Lockheed Martin contractors using English measurements, while the folks at NASA used the metric system.R. Lloyd, “Metric Mishap Caused Loss of NASA Orbiter,” CNN, September 20, 1999. Yes, a $125 million taxpayer investment was lost because a bunch of rocket scientists failed to pay attention to third grade math. When it comes to the success or failure of technical projects, the devil really is in the details. Projects rarely fail for just one reason. Project post-mortems often point to a combination of technical, project management, and business decision blunders. The most common factors include the following:List largely based on R. Charette, “Why Software Fails,” IEEE Spectrum, September 2005. Managers need to understand the complexity involved in their technology investments, and that achieving success rarely lies with the strength of the technology alone. But there is hope. Information Systems organizations can work to implement procedures to improve the overall quality of their development practices. Mechanisms for quality improvement include capability maturity model integration (CMMI)A process-improvement approach (useful for but not limited to software engineering projects) that can assist in assessing the maturity, quality, and development of certain organizational business processes, and suggest steps for their improvement., which gauge an organization’s process maturity and capability in areas critical to developing and deploying technology projects, and provides a carefully chosen set of best practices and guidelines to assist quality and process improvement.R. Kay, “QuickStudy: Capability Maturity Model Integration (CMMI),” Computerworld, January 24, 2005; and Carnegie Mellon Software Engineering Institute, Welcome to CMMI, 2009, http://www.sei.cmu.edu/cmmi. Firms are also well served to leverage established project planning and software development methodologies that outline critical businesses processes and stages when executing large-scale software development projects. The idea behind these methodologies is straightforward—why reinvent the wheel when there is an opportunity to learn from and follow blueprints used by those who have executed successful efforts. When methodologies are applied to projects that are framed with clear business goals and business metrics, and that engage committed executive leadership, success rates can improve dramatically.A. Shenhar and D. Dvir, Reinventing Project Management: The Diamond Approach to Successful Growth and Innovation (Boston: Harvard Business School Press, 2007). 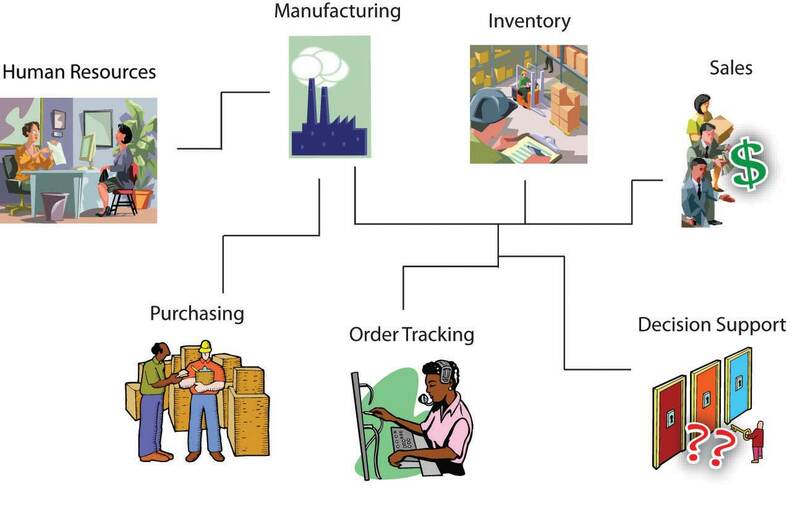 While software development methodologies are the topic of more advanced technology courses, the savvy manager knows enough to inquire about the development methodologies and quality programs used to support large scale development projects, and can use these investigations as further input when evaluating whether those overseeing large scale efforts have what it takes to get the job done. The care and feeding of information systems can be complex and expensive. The total cost of ownership of systems can include software development and documentation, or the purchase price and ongoing license and support fees, plus configuration, testing, deployment, maintenance, support, training, compliance auditing, security, backup, and provisions for disaster recovery. These costs are collectively referred to as TCO, or a system’s total cost of ownership. Information systems development projects fail at a startlingly high rate. Failure reasons can stem from any combination of technical, process, and managerial decisions. IS organizations can leverage software development methodologies to improve their systems development procedures, and firms can strive to improve the overall level of procedures used in the organization through models like CMMI. However, it’s also critical to engage committed executive leadership in projects, and to frame projects using business metrics and outcomes to improve the chance of success. System errors that aren’t caught before deployment can slow down a business or lead to costly mistakes that could ripple throughout an organization. Studies have shown that errors not caught before deployment could be 100 times more costly to correct than if they were detected and corrected beforehand. Firms spend 70 to 80 percent of their IS budgets just to keep their systems running. One in three technology development projects fail to be successfully deployed. IS organizations can employ project planning and software development methodologies to implement procedures to improve the overall quality of their development practices. List the types of total ownership costs associated with creating and supporting an organization’s information systems. On average, what percent of firms’ IS budgets is spent to keep their systems running? What are the possible effects of not detecting and fixing major system errors before deployment? List some of the reasons for the failure of technology development projects. What is the estimated yearly cost of failed technology development projects? What was the reason attributed to the failure of the NASA Mars Observer project? What is capability maturity model integration (CMMI) and how is it used to improve the overall quality of a firm’s development practices? Perform an Internet search for “IBM Rational Portfolio Manager.” How might IBM’s Rational Portfolio Manager software help companies realize more benefit from their IT systems development project expenditures? What competing versions of this product offered by other organizations?